One of my very favorite moisturizers EVER? It's Kiehl's Super Multi-Corrective Cream. (Seriously, click here for proof.) It's lush, it's rich, it's thick ... and, of course, it makes skin look and feel INCREDIBLE. 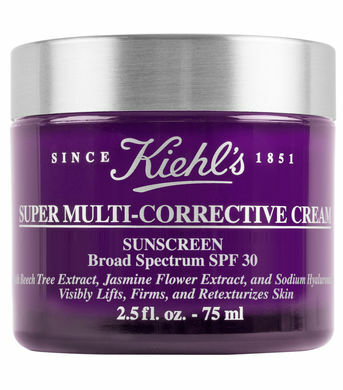 So it's really no wonder that Kiehl's Super Multi-Corrective Cream SPF 30 would follow suit. This moisturizer lifts and firms the skin while simultaneously protecting it against harmful UV rays, thanks to the addition of trusty SPF 30. And since I burn at the drop of a hat (or, more to the point, at the very first sign of sunshine), I'm definitely excited to incorporate it into my daily skincare regimen. And today, one lucky winner has the chance to receive this fabulous moisturizer! This giveaway has a retail value of $82. And, since I am on LA time and a little behind at the start of the week, I'm giving you an extra day to enter -- so you have until Tuesday, August 18 at midnight! To enter, use the Rafflecopter widget below. Good luck! What a fabulous giveaway! Kiehl's is such a wonderful skincare brand. Good luck to the entrants! I have been SO lazy about my choice of moisturizer lately. I usually use Kiehl's Ultra Facial moisturizer but I ran out. I've been...*whispers*...using my body butter on my face! I like a moisturizer that eliminates the dry area around my nose and leaves my skin looking hydrated. I look for a moisturizer to not irritate my sensitive skin. I also want it to make me look and feel good. I like a moisturizer that leaves my skin supple and contains some natural ingredients. I want to try more from Kiehls, great giveaway! I like a moisturizer that is not heavy and absorbs easily, but most importantly, the higher SPF, the better. I look for natural ingredients. Absorbs fast and is non greasy. No mineral oil and a nice texture. I look for a facial moisturizer to absorb easily, make my skin look better than without the product, and have SPF. Light and not greasy feeling. I need something that penetrates deeply, leaving me hydrated. What an amazing giveaway! I love Kiehl's! I've never tried Kiehl's. I'll have to check them out in store. I like a moisturizer that makes my skin look plump and is not too rich, because I'm oily. Oooh, I love me some Kiehl's - great giveaway! I look for many things but SPF is at the top of my list! Amazing giveaway! I need to try this one out. I used this today since I was going barefaced and I needed to be outside. It was perfect. I shared your giveaways on Sunday by the way. I look for a moisturizer that hydrates my skin without making it feel greasy or oily. I also look for a moisturizer that won't irritate my sensitive skin. Something that's not greasy but contains SPF! I look for a moisturizer that won't break me out. I look for a moisturizer that is fast absorbent, has spf and is for sensitive skin. I haven't used much from Kiehl's but this does sound very nice. I love that it's the best of SPF and skincare. I look for a moisturizer that won't break me out and hydrates my skin well. I look for a moisturizer that leaves my skin feeling soft but not overly greasy. I love Kiehls though I think it has been a few years since I have used anything from the brand. I look for a moisturizer that has SPF of at least 30. I use sunscreen every day, even during the long NH winters. I look for a moisturizer that is lightweight and has SPF in it. Would love to win this moisturizer. Thank you! I look for a moisturizer that doesn't break me out or leave my face feeling greasy. I like a moisturizer with oil control. My foundation breaks down so easily because of my oily skin. This sounds fantastic! I have been on the look out for a good day cream with SPF.